Walmart — which includes Walmart, Sam’s Club, and Jet.com — is expected to capture 4% of all online retail spending in the US totaling $20.91 billion. And in eMarketer’s July forecast, the company estimated that Walmart would capture a 3.7% ecommerce share this year. And Walmart has one of the fastest growing ecommerce businesses, which is expected to grow to 39.4% this year. Online furniture retailer Wayfair is currently seeing a 40.1% growth rate. As a comparison, Apple is expected to grow over 18% this year. This is slower than last year since domestic sales for smartphones and consumers devices are cooling down. And Apple’s e-commerce share will remain unchanged at 3.9% this year. 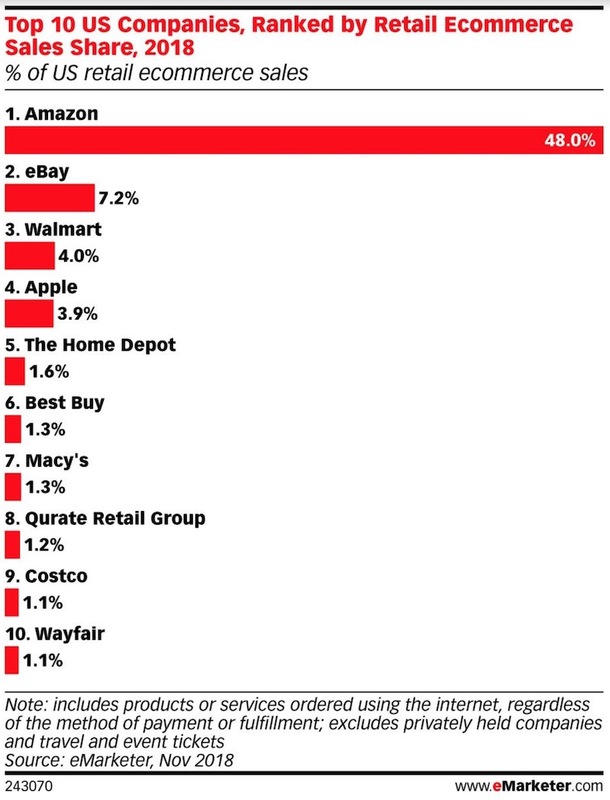 But Amazon is miles ahead of Walmart when it comes to e-commerce. Amazon is expected to bring in more than $252.10 billion domestically, which is up 29% from 2017. This gives Amazon a 48% market share of US e-commerce. And Amazon’s growth in e-commerce sales will increase 30% this year. Most of the domestic growth is coming from three categories, including apparel and accessories, health and beauty, and food and beverage. eMarketer is also estimating that Amazon is going to capture about 5% of all US retail sales. “Amazon remains the king of e-commerce and is in no danger of losing its crown anytime soon. But online competition from brick-and-mortar retailers is heating up and Amazon has felt more of a need to respond to maintain its leadership,” added Lipsman. As a whole, total US e-commerce is expected to grow 16% to $525.69 billion. This means that e-commerce will generate about 9.8% of total US retail sales this year.